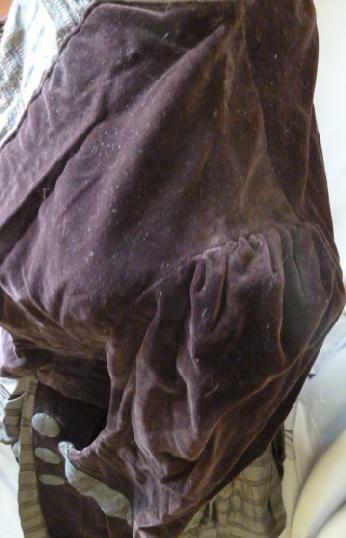 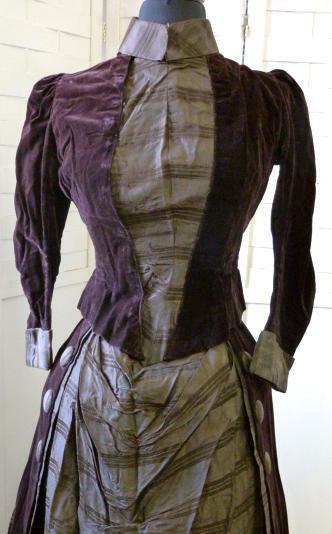 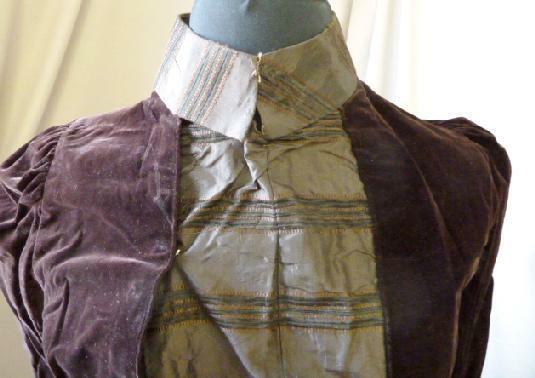 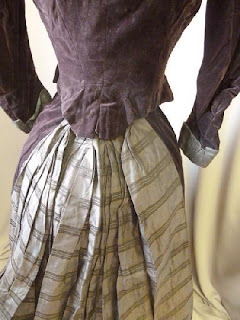 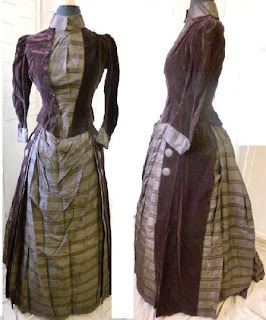 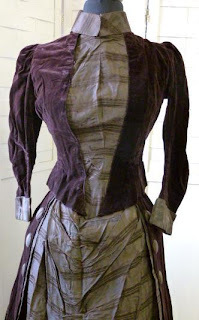 This auction is for a superb original Victorian 1880s era woman's day / traveling style dress / gown. 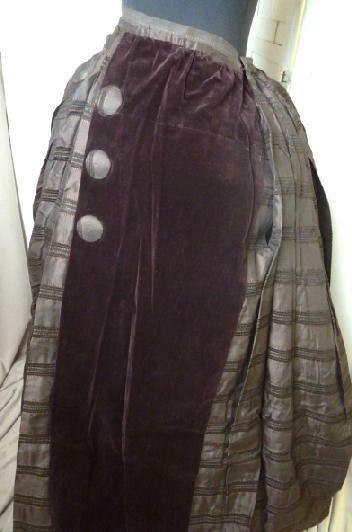 Created in two pieces, luxurious dark chocolate brown velvet and lovely grey tinted brown taffeta w darker and lighter brown horizontal stripes. 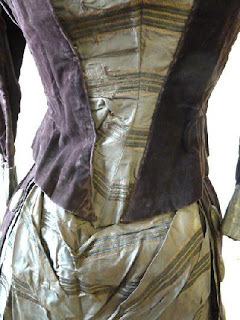 A nipped metal stay waist cinched bodice that comes just to the top of the waist, front hook eye closure ( it will appear slightly off center because it is just a little too small for my size 4 mannequin), a wrap around high neck collar and tapered sleeves adorned with matching taffeta wide cuffs. 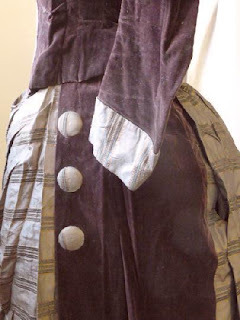 The center taffeta panel has some minimal draping down the front, on each side is 3 large self fabric covered buttons which adds just the right amount of adornment, and of course, a full extending bustle back. 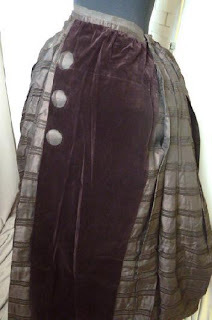 Approx measurement are 30"/32" bust, 25" waist,14" shoulder seam to seam and the skirt is 40" top of waistband to hem. This wonderful gown is in rare, extremely good condition. 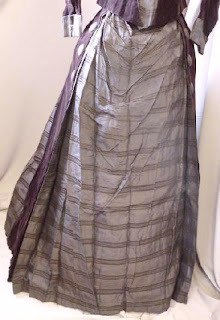 I have found only one 1/8" hole and a very few tiny pinholes and the very edge of the hemline has some minimal wear, the inner skirt hem is in very good condition.. A perfect display and if you are shopping for a dress that one could actually wear, this one is perfect. 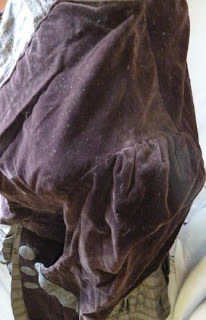 Everything the seller said except the wearing bit - seriously?!? Imagine what your skin would look like at 130 years. That is how delicate this fabric is - if not more.